We all experience that in-between space as we’re moving from one phase or chapter of life into the next. You know what I mean – that place that feels like limbo – neither here nor there. In between. The Void. Often in the past, I would find this “mood” settle on me and call it a “funk,” but I stopped doing that when I realized that by giving it a negative label, I probably wasn’t helping myself. So what IS this space, this energy in-between where I once was and where I’m going next? Welcome to The Void. Contrary to what you might conclude at first glance, the Void is not emptiness. It is not nothing-ness. In fact, the Void is quite the opposite because the Void is pregnant with possibilities. It is the space where all potentialities exist but which have not yet been called into form. The Void is teeming with opportunities, beeming with contingencies, and it is merely waiting on our decision to pick a course, a direction so that it can begin to form our desires. While being in this vague, undefined space has often created a feeling of unease within me, more recently I’m coming to understand the value of embracing the Void. I sense the existence of all of these possibilities floating around me, and I too now understand that it is my lack of clarity that has landed me in this limbo. Sometimes there are very good reasons for my not knowing more precisely what it is that I am wanting. (I’m also learning to not judge myself harshly for taking whatever time is necessary to figure out what it is that I do want.) And sometimes, it’s as simple as I just haven’t decided yet. But regardless of the reason I have landed in the Void, I find it a much more satisfying experience when I can simply allow myself to BE there. If I can simply dance with the Void, allowing myself to be moved by whatever internal melody fills my soul, I know that eventually I will move beyond the vagueness of the Void and once again relish in the feeling of passion and purpose that I so enjoy. The Void is not a barren space, devoid of life. Rather is it the exuberance of Life simply awaiting your decision. It is the conglomerate of every potential awaiting your clarity of desire to set it all into motion once again. So the next time you find yourself unsure of which path to take or what direction to go, if you feel vague and in limbo, celebrate where you are. Embrace the Void. Dance with the Void as you realize that it is merely waiting for you to choose. 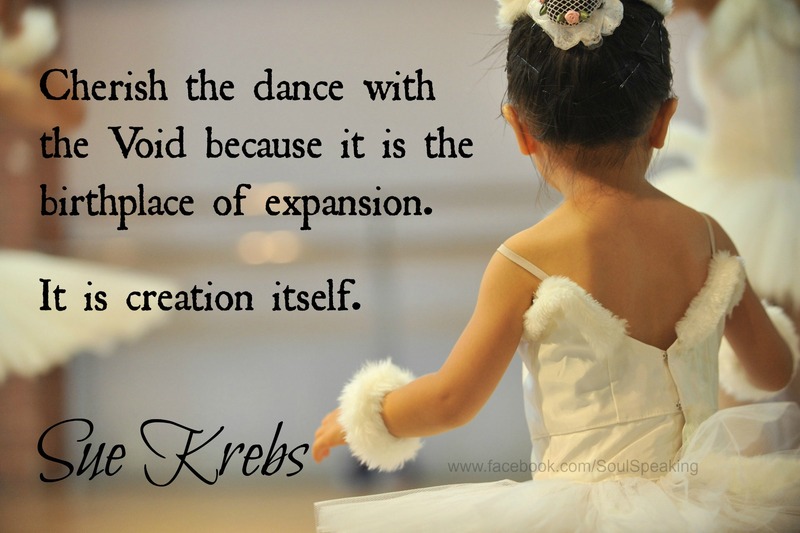 Cherish the dance with the Void because it is the birthplace of expansion. It is creation itself.